Group of fifteen (15) of various 19th century photographs, includes carte de visites, cabinet card photographs, and stereoviews. 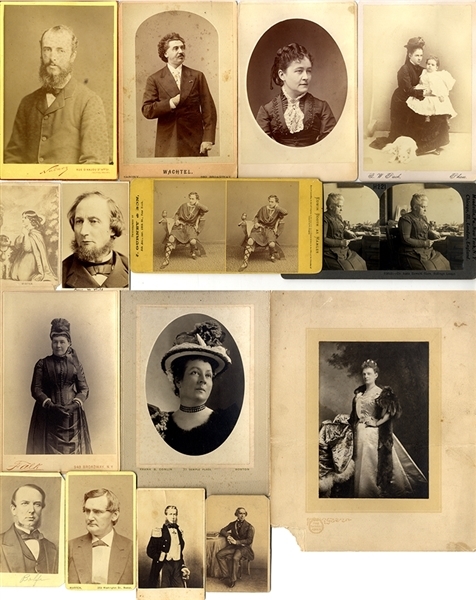 Included is a stereoview of Edwin Booth (the assassin’s brother), stereoview of Dr. Anna Howard, (suffrage leader), CDV of Cyrus W. Field, CDV of Maxmilian, cabinet card “Wachtel” by Sarony, (noted opera tenor), mounteed albumen, “Mrs. Daniel Manning, third president D.A.R.”, ... and others. Good to fine condition.